We get a triad of segments this week, the first being a girl asking Kaguya for advice about breaking up with someone, specifically the guy Miyuki coached on how to ask her out in the first place! The resulting awkward silence that plagues their relationship is a matter of having gotten together before getting to know each other. Chika takes that a bit too far and calls their enemy society itself, but the couple’s shared enemy turns out to be hunger and/or poverty, so they manage to hit it off while working together on a charity. As Kaguya surveys her good works, she notices Miyuki is there helping out too…another of the many reasons she likes him besides having a cute resting scowl. She can’t help but admit her feelings to herself and us, so she loses this one. In segment two we learn that for all his academic prowess and general physical strength and wellness, Miyuki is pathetically, horrifically uncoordinated when it comes to sports. With P.E. volleyball quickly approaching, he tries and fails to train alone, until Chika (who is really just okay at sports, but light years beyond him at this point) takes him under her wing. Chika doesn’t see why Miyuki is so into this until she realizes he’s doing it to impress (some) girl. Cut to a montage of Miyuki making progress as Chika yells and encourages and sweats right alongside. Just when she think’s she’s made a great volleyball player, he asks her to help him with the actions of the sport other than mere serving. She’s a mess by the time P.E. 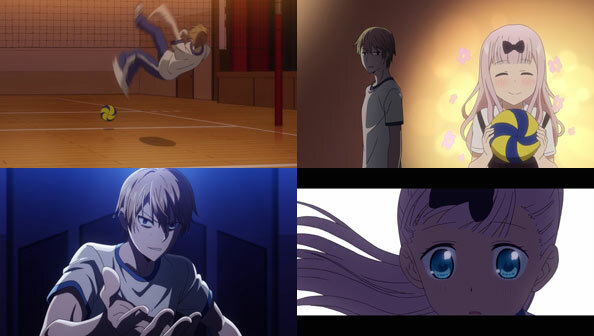 volleyball comes around, but Miyuki is the toast of the class thanks to her, so she shares his victory. The final segment is Love is War’s version of the shared umbrella scenario (SUS, not to be confused with the Subaru Sport Utility Sedan). Sharing an umbrella has a twofold purpose: to get a lot closer to the one you like, and to mark that person so everyone else knows they’re yours. Of course, Kaguya and Miyuki have to make it another battle of wills despite both wanting very much to share an umbrella, but they sabotage each other’s plans by both pretending they forgot their umbrella. Miyuki tries first to poke oles in Miyuki’s lie first, but has insufficient information. Kaguya actually meticulously planned all of this by studying the weather and slashing the tires of her ride. Just when she has Miyuki cornered, all but forcing him to reveal he has an umbrella, Chika pops up behind her with a spare she can borrow. With Kaguya now in possession of an umbrella, she decides to “sublet” it to Miyuki, letting him “do what he wants” with it. The fact she offered it to him so freely exposes her conern for him, and would make her the loser. 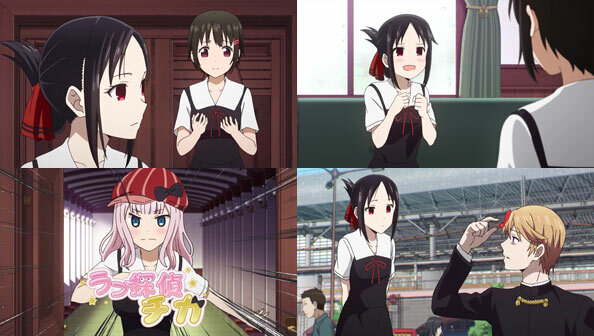 But Kaguya also freely exposes her desire to share the umbrella, changing the result to a tie. Kaguya’s smile upon Miyuki offering to share was simply priceless. Both lost by their own twisted, self-defeating logic, but both won because they got what they actually wanted: an excuse to get closer.